High performance sensor leading global solutions provider amass semiconductor (Switzerland stock exchange code: AMS), color science and technology, the global leader company (X-Rite) and its subsidiaries CAITONG (Pantone) today announced the development of the end-to-end mobile color management technology used in intelligent mobile phone in the solution, in order to achieve accurate color matching. The joint solution is composed of semiconductor sensors and optics amass spectrum, encapsulated in micro module. This combination solution helps mobile manufacturers and retailers to change the way consumers use mobile devices to search, pick and buy products, such as clothing, home decorations or cosmetics. 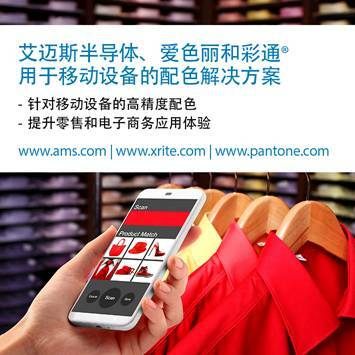 The joint solution amass and love is a global semiconductor company's first use of standard spectral color Pantone color measurement solutions that can be embedded in mobile devices. The micro module can be integrated on the back of the smartphone. The module consists of an advanced 11 channel spectral sensor and multiple optical components. The user can directly measure the color without contact with the object. The solution will use cloud technology to connect to color company's world's leading color reference system. Now, consumers, Brand Company and retailers can identify and share product color more easily, so that they can confidently search product catalogues and select items that focus on color. Love color ryoso product management vice president Richard Roth said: "for X-Rite, cooperation and amass semiconductor is the true end-to-end mobile color solutions into the ideal market. Mobile sensor solutions will complement each other with our existing Color-Eye products, enabling cosmetics, home fashion products and retail Coatings Companies to integrate color matching technology into their existing mobile shopping or augmented reality applications more easily. In this way, consumers can be more confident in the selection of colors when they search, select and buy products. Amass semiconductor company color and spectrum sensing C OIS marketing director Jean-Fran Durix said: "we are very pleased to be able to launch the world's first mobile color sensing solutions that help solve important market demand. CAITONG has been trusted by global designers, product manufacturers and Brand Company, and is widely recognized by consumers. We believe that the solution will help to promote the growth of e-commerce transactions and reduce the returns caused by color mismatches. " Amass semiconductor and company will participate in the Mobile World Congress in February 26th to March 1st held in barcelona. If you need an on-site consultation, please contact otilia.ayats-mas@ams.com to arrange the appointment time. Angrand Technology Co., Ltd. Focus On Micron Distributer Xilinx Distributer Altera Distributer Brand agency!